I learned about the footing sense of Fell Ponies several years ago thanks to a long time breeder and a particular Fell Pony mare. This characteristic of Fell Ponies came up in a conversation with the breeder about what fell-bred ponies know that is lost over generations when the ponies are bred away from the fells. It is the sense to know where to place their feet to be safe in crossing terrain. For ponies on the fells, it can be a knowledge of how to cross bogs that is important. In my case it is usually how to navigate over snow and ice. I’ve been using that same Fell Pony mare as my chore pony this winter. And I’ve been trying to use her more than in the past, my thinking being putting miles on her legs is beneficial for her and saving miles on mine is beneficial for me. Where I used to ride her up and down the driveway for chores once a day, I’m now doing it as often as three times a day. I figure I’m saving myself nearly three miles of walking a week! Rather than heading straight down the driveway, which is covered with packed snow, I noticed that my mare was starting to weave from side to side to middle to side to middle to side of the road. We were taking longer to get to our destination, and I concluded my pony was asserting her independence rather than following my instructions about where to go. Clearly I needed to take control of the situation, my thinking went. So the next time she started to wander from one side of the road to the other, I took up the reins and asked her to continue on the line down the road that we’d been on. Perhaps you’ve already guessed where this is going. You would think I wouldn’t need to be reminded about the footing sense of a Fell Pony because I value their intelligence so much. Within a few strides of me forcing my pony to stay on a line that I had in mind, she started slipping. She hadn’t slipped on our rides for weeks before that! Apparently that weaving from side to middle to side of the road was about finding good footing, and she was using her footing sense rather than being disobedient. I chuckled at the comeuppance I’d been dealt (not the first time by a Fell Pony), and I’ve gone back to letting my pony choose our path down the drive. Hopefully I won’t need a reminder about footing sense ever again but somehow I’d bet I will! 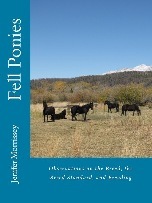 You can read my previous stories about footing sense in my book Fell Ponies: Observations on the Breed, the Breed Standard, and Breeding, available internationally by clicking here or on the book cover. The latest issue of The Livestock Conservancy’s newsletter landed on my desk and immediately caught my attention. The cover article explained changes to the organization’s Conservation Priority List for 2018. I of course scanned it for the equine section and was surprised to read that the Fell Pony had been moved from Watch to Critical “based on global population numbers of less than 2,000.” (1) This reasoning didn’t pass my common sense test, so I decided to learn more. I felt fortunate when the organization’s executive director, Alison Martin, answered the phone when I called. I explained that I felt there were more than 2000 Fell Ponies in the world, so I was curious about her organization’s reasoning. The answer seems to be that The Livestock Conservancy used numbers from its British counterpart, the Rare Breeds Survival Trust, extrapolating from annual registrations of foals. It appears from our conversation that either RBST had preliminary annual registration numbers that were far below the final count for 2017 or they were tracking hillbred foal registrations. Certainly the latter is cause for concern based on my own research and anecdotal comments from UK breed enthusiasts. RBST lists the Fell Pony as Vulnerable, the third tier in their list, while the Livestock Conservancy has just moved the breed to their first tier. In my opinion, the US organization shouldn’t be this out-of-step with the breed’s home conservation organization. Since I had her ear, I asked Alison whether her organization would consider tracking hillbred Fell Ponies separately from the breed as a whole, just as the organization does with Traditional Morgans. She reminded me that in the case of Morgans, an open stud book led to crossing with other breeds so there is a genetic distinction identifiable by DNA testing between Traditional Morgans and others equines in the breed. I then led the conversation into losing traits from a landscape-adapted breed like the Fell when the ponies are removed from their home terrain. She used a rare chicken breed as an example saying that the traits are still there in the DNA, so, for instance, returning non hillbred ponies to the fell should be theoretically possible. I said that for welfare reasons this was rarely done, and she pointed out that it could be done with good management; it’s done with wildlife species regularly. I appreciated this perspective. She went on to say it would make a great graduate research project to study ‘refelling’ ponies. As Alison emphasized, being back on the Critical portion of the conservation list isn’t a good thing. I agreed. Generally being there is an indication that there aren’t enough breed stewards. That isn’t necessarily the case with the Fell Pony, but we are lacking hill breeders, people who steward ponies on their native fells. Alison requested that I send my current research on hillbred ponies to her. It will be in my June newsletter, so if you want to receive it and aren’t subscribed, click here! Couch, C.R., et al. “Changes in the Conservation Priority List for 2018,” The Livestock Conservancy News, Spring 2018, Volume 35, issue 2, p. 1. More information about the Fell Pony breed can be found in my book Fell Ponies: Observations on the Breed, the Breed Standard, and Breeding, available internationally by clicking here or on the book cover. First, a definition. According to the Oxford English Dictionary, a float is “a low-bodied dray for transporting heavy goods.” It has been suggested to me that the word in this context is of Scottish origin. A milk float then is a low-bodied cart or wagon for transporting milk. Two Fell Pony colleagues have shared with me that their first experience with Fell Ponies was with milk floats, so I had to learn more. My first memory of the association between Fells and dairies is from talking to Bob Charlton of the Linnel stud. Judith Bean shares, "A black Fell walked up the vicarage drive where I grew up and parked (without direction from the farmer/milkman) beside the back door." Joe Langcake says Fells were ideal for this work. Helen Gallagher shares about her grandfather's milk float. More stories like this one can be found in my book Fell Ponies: Observations on the Breed, the Breed Standard, and Breeding, available internationally by clicking here or on the cover image. It didn’t seem to matter what I did that morning; Facebook was involved. My husband and I were discussing travel plans, so I needed to send a message via Facebook. Then I needed to schedule a telephone conference, so I sent another message. In the process I checked my news feed for anything Fell Pony related as well as glancing at what Facebook thought were the pertinent headlines of the day. Then of course the radio news was full of Facebook because the company’s CEO was testifying before Congress. During CEO Mark Zuckerberg’s testimony before Congress, as reported on the news that morning, he was asked about the new requirements under the European Union (EU) data protection law called the General Data Protection Regulation (GDPR), which goes into effect on May 25, 2018. He said his company was working towards compliance and that it might be a good starting point for similar efforts in the United States. Later that day, I was speaking to someone with knowledge of the Fell Pony Society. Most of the work of the Society is of course done by volunteers, with just a small staff in the office. Whenever I talk to the office, I try to ask what is currently occupying the staff’s time because in the past I’ve been surprised by how much of that scarce resource goes into things the Society membership rarely knows about. Years ago I remember learning about the amount of effort that was required to comply with European Union (EU) regulations around equine registration. It seemed strange to me that the EU would be involved in this sort of minute detail. I wasn’t surprised by the Brexit vote more recently as a response to this sort of burden due to membership in the EU. During the phone conference I had scheduled via Facebook, I learned that once again the office staff was having to spend some of their scarce time on something the membership might never be aware of. It turned out it was that same topic that Mr. Zuckerberg had been asked about during his testimony before Congress: compliance with the General Data Protection Regulation. The connection with Facebook went beyond that, of course, because it is in part because of Facebook’s use of user data that the GDPR was put into effect in the first place. Rather than spending time on more pony-related matters, the Society office was having to comply with yet another EU regulation. The world felt small and very inter-connected as I began my day. Shortly after I became involved with Fell Ponies, what I think was the first internet-based community for Fell Pony people was created as a Yahoo group. I still have printouts of things long time breeders like Carole Morland and Christine Morton shared there. At the moment, the vast majority of sharing amongst the international Fell Pony community is done on Facebook. It’s hard to imagine that changing, though a decade ago I might have said the same about the Yahoo group!